It's time for Doodle Pantry's May digital stamp release. Wow, did Laurie out-do herself this month. Wait until you see what she has created for all of us. I am using the Fancy Flamingo set. Look at all these fabulous images and sentiments, not to mention incredible digital papers you get with this set. All the images, the sentiment and the designer paper are from the Fancy Flamingo set. There are two different flamingos that come in the set, but I chose to use two of the same one. I just flipped one of them horizontally so they are looking at each other. I colored the flamingos with Copic markers (pink - R81, R83 and R85; blue - B02, B05 and B16; beaks - N6 and N8). The heart was downloaded from the internet and I placed the sentiment inside the heart. I added bling around the necks of the flamingos and at the bottom by their feet. I cut out the flamingos using Spellbinder's Opulent Ovals and popped it up on the designer paper, then layered it on blue card stock and a white card stock base. A new digital challenge will also begin at noon today and run until May 24th over at the Doodle Pantry blog. The rules are simple...just use a Doodle Pantry image, not just a sentiment, and enter your card using the inlinkz button. There are lots of images on Doodle Pantry's Freebie page. Just for entering the challenge, you will receive the Fruitful Star set free. Here is a picture of that set. Always look on Doodle Pantry's Specials page before checking out. This month, the free with purchase set is Pearfect Wormy. But you need to hurry, it is only free with purchase until May 24th. Also, don't miss our 25% off everything special (minimum purchase $3.00)! May 1st thru May 6th only. Just fill your cart with products totaling at least $3.00, then when you view your cart, enter the coupon MAYSALE in the field and CLICK SUBMIT to see your discount apply. Continue with checkout and pay. I hope you all enjoy this fun new release as much as I do! Please stop by my fellow design team members pages and see what they have created. You will find the links to their blogs on the right-hand side of my blog. LOVE this fabulous, fun flamingo card! That die is gorgeous, Susan... love how the beautiful digi paper peeks through. Awesome design and coloring! Fantastic Susan, love the die cut, at first glance i thought you had woven ribbon through it! A beautiful card! I love your adorable flamingo card! Wow that is a beautiful die cut! Great job! This is an adorable card! Great design and coloring! Love the added bling at the bottom! What a awesome card! I love how you flipped the flamingo to face each other! That is what I love about digital...so many options! Your card is simply beautiful! It's perfect, the coloring so pretty and a gorgeous mat behind them. Gosh, I can't wait to case several of the flamingo cards by several of you ladies. Love Love Love!!! First, I love that die cut! And, I love that the silly birds are different colors -- super cute!! Great card, Susan! Love the anniversary theme and your layout and embllishments are perfect! 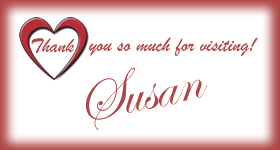 Oh my, Susan, what an adorable pair, and card! LOL It makes me smile really big! I can NOT believe that gorgeous patterned paper comes with the set. Wow. She did outdo herself. Lucky you get to play with it all. You are so talented to bring in so many stunning additions, the gorgeous frame, and heart, just finish off this wonderful card. I always kid my hubby, that it's time we got some flamingos for the yard, we are getting old enough. Like it's a rite of passage for retired people. Sun City is FULL of them, here in Arizona! LOL It's a fun image, no matter how you look at it! Kudos. What a fun card!! Your flamingos are so cute!! What a fun card - love the blue and pink birds and this is a perfect anniversary card. The bling just adds that extra zip. Great card. Super fabulous card Susan!! Love the pink and blue flamingos...so creative! Love the added gems too. This is very cute! Love the bit of sparkle you've added! 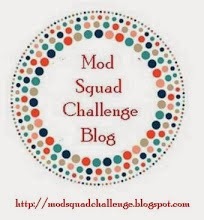 Thanks so much for playing along in the Simon Says Stamp Happy Mail Challenge! I love the bling on the flamingos and the rhinestone flowers, awesome!